My friend came up with question about OpenBSD. He ask me about possibility of install OpenBSD remotely and continue to manage it for different purpose. I promise to help but due to time constraint I can not visit his house and teach him. I decide to make this post for him but I hope this simple guide will also help others that might face similar problem. I use vps service from Vultr for this guide since I can use my existing credit and also quick setup process. How to install Zorin OS on Vultr using custom iso (study case install Linux for host Windows based application using wine). How to Install FreeBSD 10.1 on VPS (study case install FreeBSD 32 bit in Vulr and activate ipv6 plus local network). I use Australia for VPS server location so I use nearest OpenBSD mirror close to Australia (Internode amd64 OpenBSD 5.5). This tutorial use OpenBSD 5.5 but you can change the iso file (I’ll update latest iso list when OpenBSD release new version). 64 bit OpenBSD 5.6 iso, click here. 32 bit OpenBSD 5.6 iso, click here. Enter the link on “remote URL” section. Wait for while as Vultr will upload it to their server. I choose $5/month server that give me 768MB memory, 15 GB space and 1000GB transfer. 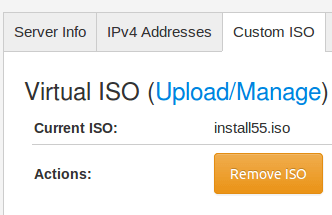 Vultr will mounting iso file (wait for while as their server will figure out location mirror and will try to relocate iso file). System will automatically restart when its done. Write down IPV4 information as this info will be needed when install process begin. Click “Console” to see what is going on now and continue install like you see it in front of your eye. If you see this view then you can continue with the rest steps as OpenBSD provide detailed process in their manual. Click here to view. I continue install process follow OpenBSD guide. Click “OK” button to remove iso file. Try to access the server using SSH ( I activate ssh access during install process). The authenticity of host ‘108.61.213.1 (108.61.213.1)’ can’t be established. ECDSA key fingerprint is f6:3c:02:77:42:1a:e2:54:3a:f9:ca:1d:0b:f0:66:66. Warning: Permanently added ‘108.61.213.1’ (ECDSA) to the list of known hosts. I forgot that I already add user that also block root user from login remotely (login as user first then use su to change to root). 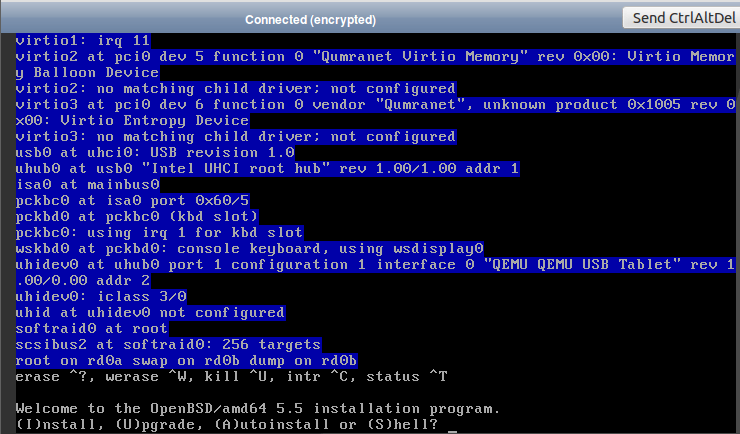 Great at this point I have working OpenBSD server using KVM virtualization. 2. What should i put in “DNS domain name” ? anything you want. I used to enter my domain. 3. What should i put in “DNS name servers” ? I use google dns (8.8.8.8 and 8.8.4.4) or other dns server you know. 4. I live in Europe, which location should I choose for my OpenBSD VPS ? Amsterdam, London, France or Frankfurt. 5. Do they backup my vps? yes, auto backup available with extra payment. Depend on your server size. If you choose $5/month then you pay $1 for auto backup. Feel free to try choose different server size and enable auto backup feature. You’ll see different charge. 6. I bit confuse which type (32 or 64 bit of OpenBSD iso ) I should use? In general, choose 32 bit for memory lower than 1 GB and use 64 bit for memory more than 1 GB. 7. What is the impact of utilize different type that I can see? in general 32 bit consume lower memory (try type top command and see the difference) than 64 bit but 64 bit is more stable than 32 bit. You decide. 8. I have working OpenBSD 5.5 should I upgrade to 5.6 ? yes and no. Never fix something ain’t broke. If you need a feature that not available in 5.5 and that feature exist in 5.6 then you need to upgrade. 9. I have problem with my email server. I don’t get email in my mailbox. I did not touch any email configuration in my server. Any idea? Check for log. By default Vultr block email port. You need to open a ticket. Asking them to unblock it. 10. Why Vultr make it hard to enable email port? I don’t know. In my opinion that policy is good. By set the policy to block email port they want to make sure their network free of spam and in long term they will gain respects from other network and system administrator.